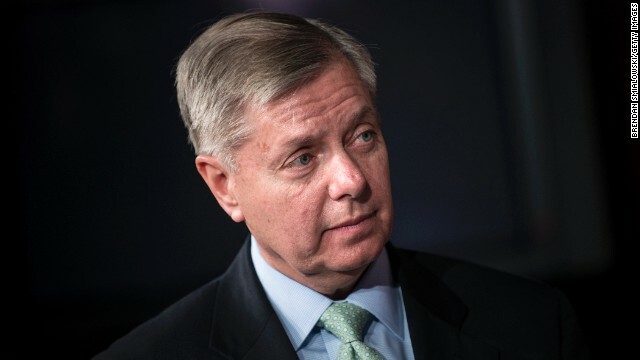 Washington (CNN) - Republican Sen. Lindsey Graham said Thursday the administration is to blame for not preventing last week's terror attack at the Boston Marathon finish line. This marks the first time the attacks have been so politicized in the search for answers for how the two brothers suspected of the bombings slipped past government anti-terror detection measures. Graham put it in the same category as the September 11, 2012 attack on the U.S. diplomatic post in Benghazi, Libya, in which four Americans were killed. Graham and other lawmakers, mostly Republicans, argue the Benghazi attack was a major security failure on the part of the Obama administration. Asked if Homeland Security Secretary Janet Napolitano bears responsibility for allowing Tamerlan Tsarnaev to fall through the cracks of federal agencies, Graham said the fault falls on a broader scale. "I have no idea who bears the blame. I just know the system is broken. The ultimate blame I think is with the administration," he told CNN on Capitol Hill. "The FBI and the CIA are, they have great people but you know we're going backwards in national security. Benghazi and Boston to me are examples of us going backward." Graham has been one of the most vocal lawmakers in Congress who's been critical of the government's handling of Tsarnaev, who was investigated by the FBI in 2011 at the request of Russian authorities over concerns of radicalization. Tsarnaev, who died last week after a shootout, and his brother, Dzokhar, are accused of plotting and carrying out last week's bombings, as well as killing an MIT police officer. The marathon blasts killed three people and wounded more than 260 others. Later Thursday, Graham spoke to CNN's Anderson Cooper, saying he was simply offering "appropriate criticism" of the administration. "Bin Laden may be dead, Anderson, and I'm glad he is. But radical islam is not, and in our own backyard the threat is growing," he said. "And 'knock off jihadists' is probably not the right term to use, I think it's quite frankly minimizing the threat we face," he said, referring to Vice President Joe Biden's description of the two brothers on Wednesday. The senator argued Congress should share in part of the criticism, saying budget cuts have put pressure on federal security agencies. Asked if he's politicizing the issue, Graham said the goal is "not to blame (the administration) exclusively, but to fix it." "When Bush screwed up, I said I think you're screwing up about Iraq, Mr. President," he said. "At the end of the day, the administration in chage deserves the credit when it works and the blame when it fails." In addition to interviews with Tsarnaev and his family members, the FBI says it checked databases, phone conversations, travel history and plans, and associations with persons of interest. At the time, however, they "did not find any terrorism activity, domestic or foreign," the agency has said in a statement. Tsarnaev later traveled to Russia in 2012, where he spent six months. Members of Congress have been calling for hearings to learn more about the investigation of Tsarnaev and communication between the FBI, the Department of Homeland Security and the CIA. Napolitano told legislators on Tuesday that Tsarnaev's departure for Russia in January 2012 pinged "the system," but Republican Rep. Bob Goodlatte of Virginia, the chairman of the House Judiciary Committee said, told CNN Wednesday that the information apparently never made it to the FBI. "They were not apparently sharing that information," he said. "So the FBI, according to what we now understand, did not know that he was in Russia for six months and and did not follow up on his return. So all of these things lead to more questions about what needs to be done to make sure that these types of things don't happen in the future." Officials have been looking into what he may have done there during that time. The young man is believed to have posted videos online tied to militant jihadists in the region. Sources told CNN that Russia had separately asked the FBI and the CIA to look into Tsarnaev in 2011. But a ranking Democrat on a House intelligence subcommittee said Thursday he does not see an intelligence-sharing failure. This information was put in a database, it was shared among different agencies, it was shared with a joint terrorism task force, and that's exactly what should happen," U.S. Rep. Adam Schiff, D-California, told CNN. "Some are racing to say that the FBI dropped the ball or the agencies weren't talking to each other, and that just doesn't seem to be the case," he added. Schiff is a ranking member of the Subcommittee on Technical and Tactical Intelligence. - CNN's Tom Cohen and Ashley Killough contributed to this report. So 9/11 fault lies with the Bush administration – actually even moreso since they received information from the Clinton administration that BinLaden was planning to attack using airliners. Maybe Graham is getting senile or something – he has certainly forgotten all the information the Bush administration on the plans to use airlilners for an attack on this country and basically did nothing. We know that at least the FBI followed up on the information they received from Russia. This guy is too predictable he tried to blame the FBI last week and back track,and i was waiting for him to blame president Obama so no surprise here. Sad, sad sad;this is a US Senator that seems to have a hatred for the US president. Senator Graham is a real embarrassment, no discretion, insubordination, and outright disrespect for the elected president of the USA. loose reelection because he not good for this country, just a few hateful peoples. Graham also blames Obama for male pattern baldness, Halitosis, irritable bowel syndrome and reruns of "Ellen". In short, Lindsey Graham is useless sack of hammers. What this "thing" is promulgating is dangerous, irresponsible and untrue. Unfortunately his agenda and his message can fall on sick ears who because of their own inbred prejudices are more than willing to take this confabulator at his claim, and seek retribution. May God protect you Graham if something befalls our President because of your baseless and hateful insinuations. These republican law makers who jump to the front of the line to lay blame are just shameless politicians with 20/20 hindsight trying to win points for themselves by blaming others whenever anything goes wrong. I didn't see anyone doing this after 9/11, which was by far the worst terrorist attack in the world to date and which the Bush administration clearly had forewarning on. What this country needs is not finger pointing, but coming together to do whatever is necessary to protect its citizens. Finger pointing is nothing but a waste of time. This guy is so predictable. He will probably blame the demaise of the GOP on POTUS too. He and McCain need to just go away. Graham it's time for you to run for president or shut up and get out of politics! You are about as greasy as they get. Who was President in 2001, when the bombers entered the US? So, the ultimate blame isn't on the bombers themselves, eh? Closet-case must be gearing up for a tough reelection next year. CNN you might as well close this article... not one, not one out of the 26 comments I have read cares for this jerk or his comments. As much as I hate the election cycle this one I will be looking forward to. This is coming from one who WAS a Republican! Mr. Graham is certainly one of the most disgusting creatures on the planet, especially given is long-term attempt to score points by politicizing tragedy. I eagerly await his assessment of the Iraq war howver, as he apparently is just warming up on events such as those in Boston last week. I also eager await his Constitution-trashing opinions on how best to deal with the American citizen already in custody. For one of our government politicians.........Lindsey Graham is actually a very sick man... HOW can he blame WASHINGTON AND THE PRESIDENT FOR WHAT HAPPENED IN BOSTON.?? ?Why not the CIA or the FBI ....why not the govenor of Mass. or the mayor of Boston?? ?....all ludicrous!!! !....THIS MAN IS REALLY ON THE EDGE AND I THINK SOMETHING SHOULD BE DONE ABOUT HIM BEFORE HE REALLY DOES SOME IRREPARABLE DAMAGE!!!! !......this is serious!!!! If Sarah Palin is president instead of Obama, she would have easily foiled the brothers' plot and prevented the bombings from ever happening. Lindsey, you are what my mother used to call "a hot mess". For the love of God retire before your eyeballs spring out and your jaw falls down on your chest. Puppet.